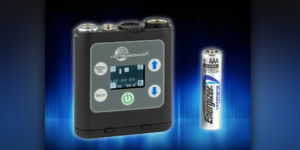 Lectrosonics announced their new PDR recorder today. The company is best known for their line of excellent wireless systems and is the current industry leader in that regard. The PDR is new territory for them, and it looks like a good first entry. According to the press release, it’s not much bigger than two or three AAA batteries and will run for six hours on a single lithium AAA. It uses the same TA5 input that most of their wireless transmitters take, and a 5-Pin Lemo for Timecode input. At the moment, it appears audio input is mono. For someone heavily invested in Lectrosonics, this is a steal at 900 dollars. I could see myself using this in places where wireless systems are impractical for environment or range issues such as on a submarine or recording race car drivers. The only comparable product I can think of is the Zaxcom ZFR200, which provides the same functionality and a few additional features for only 950 dollars. The ZFR may be the better option for someone heavily invested in Zaxcom’s systems. I look forward to testing the PDR out and will post my impressions when I get my hands on it.